An electronic notification system has been designed for general practices to report cases of disease and injury related to exposure to hazardous substances, including lead absorption. An electronic notification system has been designed for general practices to report cases of disease and injury related to exposure to hazardous substances, including lead absorption. It was developed by bestpractice Decision Support (BPAC Inc) and the Centre for Public Health Research, Massey University and is funded by the Ministry of Health. The notification system was introduced progressively throughout New Zealand in 2013. There were 244 notifications in 2013 and 229 in 2014. Of these, 180 and 130 were for lead absorption in 2013 and 2014 respectively. There are a multitude of possibilities of exposure to hazardous substances, such as: ingestion of cleaning products or cosmetics by children, overdose with agrichemicals, illness caused by exposure to solvents or chlorine, contact dermatitis due to chemicals, a fireworks burn or eye injury and “huffing’ (inhaling) of butane. 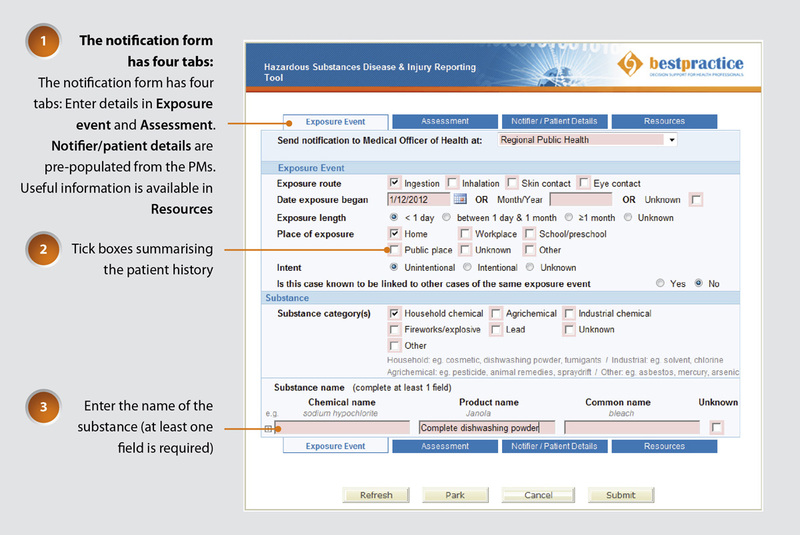 Look for the “Hazardous Substances and Lead notifications” module on the bestpractice Decision Support dashboard (see Figure 1 for an example). Submitting the form will send it to your local Medical Officer of Health via a secure system. Cases of lead exposure including occupational and non-occupational, in which a patient has a blood lead level of ≥0.48 µmol/L, are required to be notified. The electronic form can be used for these notifications. Cases of poisoning arising from chemical contamination of the environment (e.g. from carbon monoxide, agrichemical spraydrift) are also required to be notified under the Health Act 1956, and this can be done via the electronic form. Primary care notifications allow identification of substances which are causing harm, and can lead to controls being put in place to prevent disease or injury. For example, exposure to lead from deteriorating lead-based paint can be reduced through a range of remedial actions. Some controls may be regulatory; for example, the sale of highly alkaline dishwashing powders was prohibited in 2007 following increased reports of oesophageal and upper airway injuries in children who ingested this powder.